Join us in Ottawa on Thursday, June 4th for the launch of a timely new book from the Canadian Centre for Policy Alternatives' Education Project. 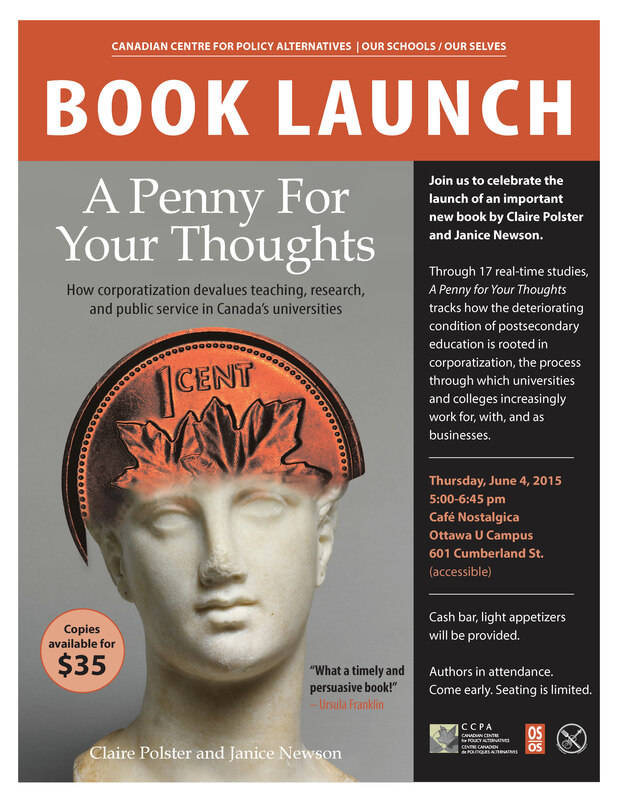 Authors Claire Polster and Janice Newson will be there to discuss their book, A Penny for Your Thoughts, and for a conversation on corporatization in Canadian universities. Simmering conflicts in higher education have reached the boiling point across Canada and around the globe. Teach-ins, occupations, strikes, and mass protests are being mobilized against exorbitant tuition fees, declining educational quality, mismanagement, the commodification of research, and the suppression of free speech and critical inquiry. A Penny For Your Thoughts shows how Canadian higher education has come to this point. Read more about the book here . For more details about the Ottawa book launch, or to RSVP, click here .